Turbocharged engine suffers from lag at lower revs. Tiny boot. Brakes are not sharp. Softer and doesn't feel as together as an MX-5. Withdrawn from UK market from January 2018. 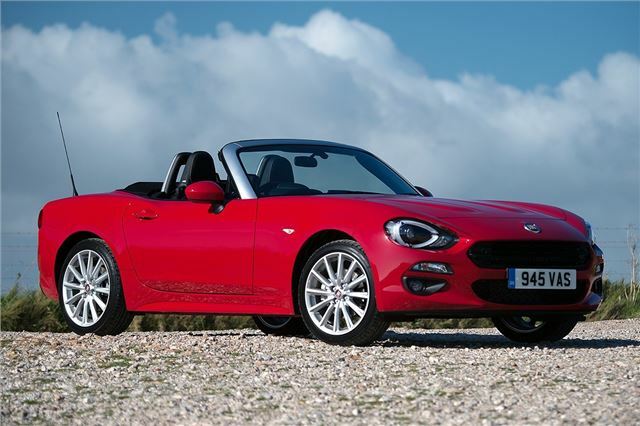 FIAT 124 Spider Withdrawn from UK market. 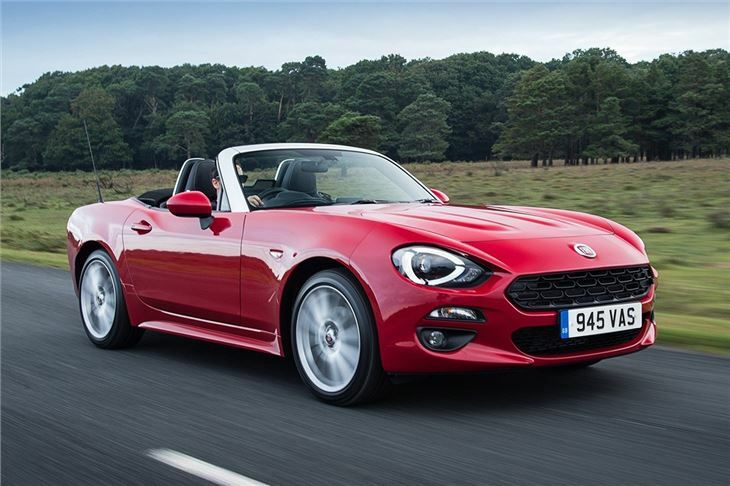 Fiat’s new roadster revives the much-loved 124 Spider with great effect. 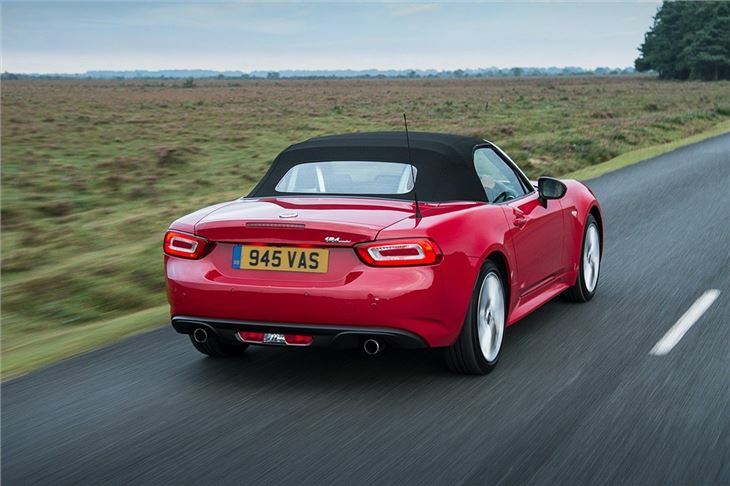 While it's based on the Mazda MX-5, there are subtle changes to the steering, gearing, suspension and interior, giving this car a personality all of its own. But let’s start with the biggest change of all – the engine. Under that long, Fiat-badged nose is the Italian carmaker’s 1.4-litre turbocharged petrol. It produces a healthy 140PS while returning a claimed 44.1mpg. Not bad for a car that will hit 62mph from a standing start in just 7.5 seconds. The styling is also different. Not only is it more aggressive than its Japanese sibling, it’s also aimed more at the US market, which explains the baby ‘muscle car’ vibe. 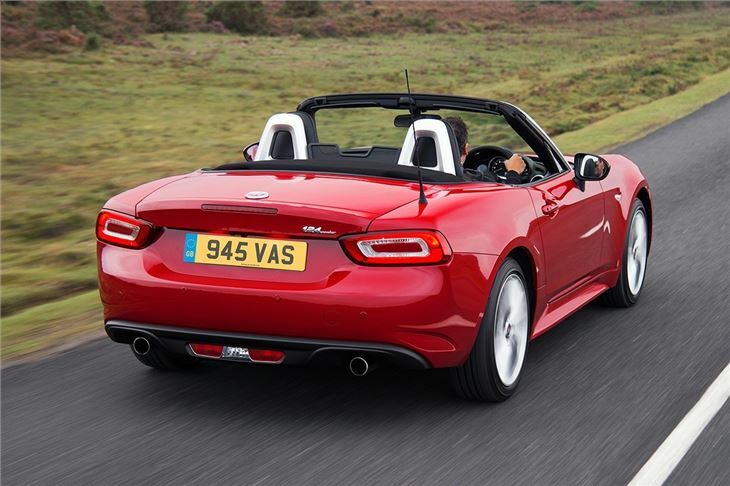 Fans of the original 124 Spider should be satisfied, though – the hump in the front bonnet remains, there’s a hexagonal front grille and the rising tail over the rear arches is also similar to the classic design. 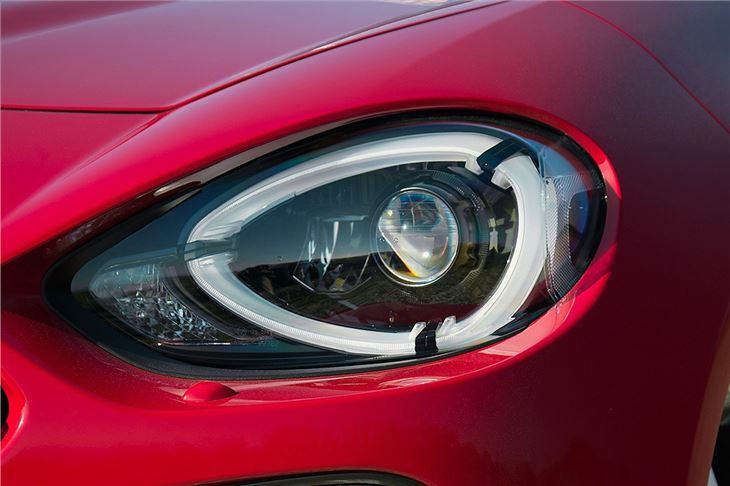 Inside, the Fiat feels more luxurious than many of its rivals. From the visible hand-finished stitching on the seats to the carpet on the inside of the boot, comfort was always going to be more important than on-track performance. 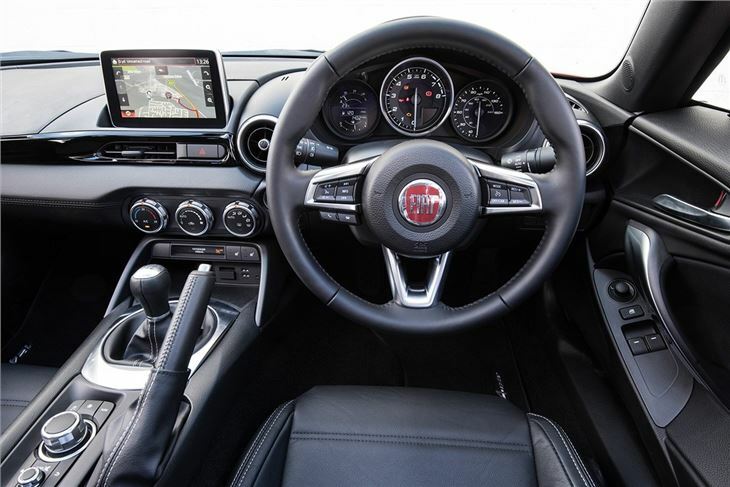 While the layout is familiar from the MX-5, Fiat has added soft-touch materials and gloss details to lift the ambience. And it’s the interior that sets the tone for the ride and handling. Don’t be fooled by the comfort, this is still a proper sports car that will delight keen drivers. It’s just that this incarnation of the convertible 124 is a much more forgiving Italian mistress. Gone is the breathless engine, the light and precise steering, and constant threat of a slap in the face – this model is more mature and easy going. Standard kit includes air-conditioning, leather steering wheel and gear knob, cruise control, alloy wheels, Bluetooth and keyless start. Not bad for the money. All of which brings us to perhaps the most important difference between the 124 Spider and the MX-5 – the price. 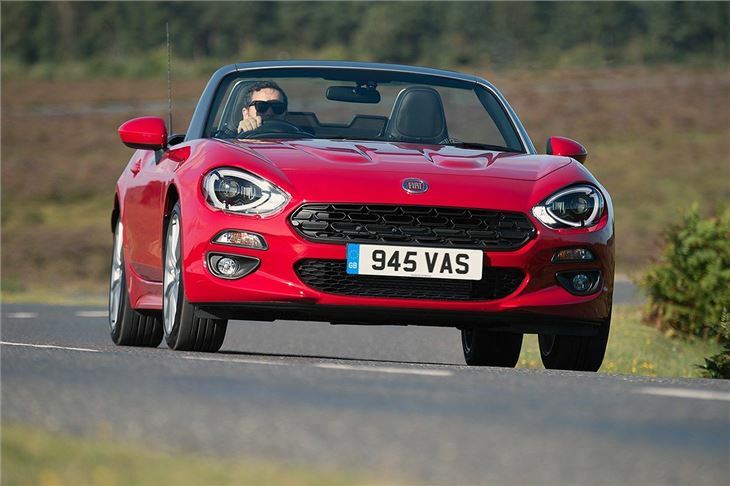 The Fiat 124 Spider costs over £1000 more than the basic MX-5, but less than the 2.0-litre. So it really comes down to which car you fancy. The normally-aspirated, more-involving Mazda – or the plusher, turbocharged, more placid Fiat. Whichever one you choose, though, you won’t be disappointed.